Perhaps you’re overwhelmed by all of the Bible journaling resources that are available. Leaders regular ask me for resources to help them lead a Bible Journaling event. Today I’ve got some new Bible journaling and lettering resources to share with you that I know will help! 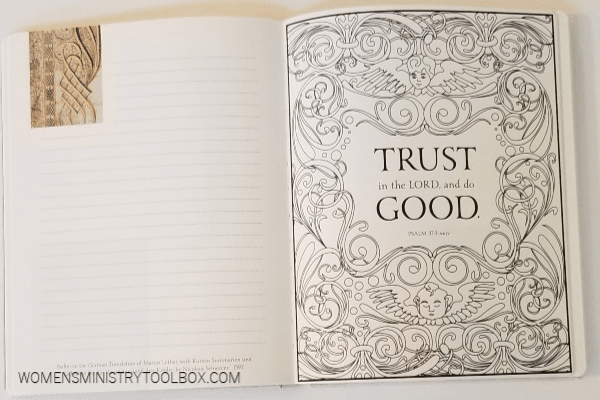 I recently had the opportunity to review three new Bible journaling and lettering resources: The Faith & Lettering Journal, The Illustrated Word, and Illuminate Your Story. 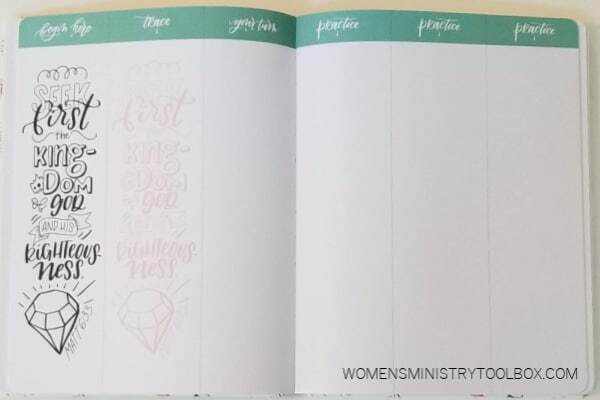 Each journal is unique and points women to scripture in a different way. The Faith & Lettering Journal, by hand-lettering artist and graphic designer Krystal Whitten, offers tutorials for lettering styles, embellishments, Bible journaling, and more. Perfect for even for beginners, pages encourage the use of the pen to declare the Lord’s praise. Many pages provide a guide for creatively lettering scripture verses. You could practice on the pages in the journal and then confidently transfer your work over into your Bible. This journal will appeal to those who long to embellish their Bible with beautiful scripture verses. Having studied the history of Bible transcripts, this journal held a unique appeal to me as forty illustrations from ancient manuscripts have been recreated as line drawings. There’s something special and sacred about ancient drawings that were used in some of the very first Bibles. This book will appeal to those who desire a combination journal and coloring book. Illuminate Your Story is also from the Museum of the Bible. Step back in time to the days of medieval Europe when monks spent days creating illuminated letters, an artistic masterpiece unlike most have ever seen. 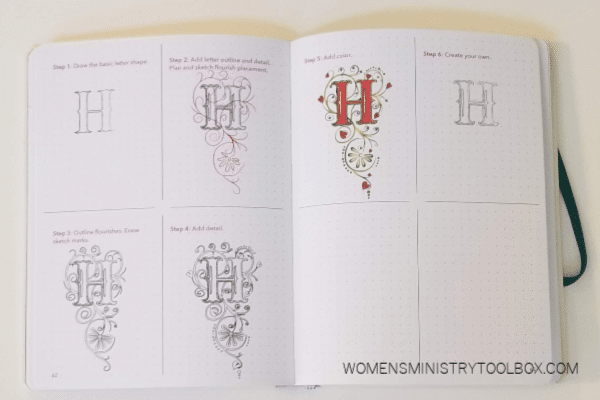 This journal offers a step-by-step guide for how to draw illuminated letters (like the “S” on the journal cover). The introduction includes a detailed history and information on biblical illuminations. Providing the most detailed, step-by-step instructions of all the journals, it will appeal to those who want to create beautiful letters. As we seek fresh ways for our women to engage with Scripture, hand-lettering will provide inspiration for our women’s devotional time, imprint scripture upon their heart, and help them dig deep into the Word of God through the art of lettering. Something special happens when you slow down and take time to focus on Scripture in a creative way. Give them as a gift. Place them in your door prize basket. Use them as a resource for your Bible Journaling event, retreat workshop, or crafting event. Consider purchasing tracing paper for attendees to use at the event and then give each book away as a door prize at the end. Purchase them for yourself – to enhance your devotional time. As you seek out Bible journaling resources for yourself and your women’s ministry events, consider these beautiful, high-quality journals. You won’t be disappointed! Disclosure: Worthy Publishing provided copies of these journals at no cost in exchange for an honest review. All opinions expressed are 100% my own. One year ago: Christmas Version: What’s on ur phone?